"Jeremy," He said in his soft voice. A voice which was so melodic and subtle, with it's sing-songy Manchester accent, that it seemed to permeate the very souls of all who heard it. It was hard to believe this was the voice of the same man who could summon the most righteous fury during his sermons. His voice would grow loud, and all his kind appearance would twist into something truely terrifying. It was this very transformation which had attracted Jeremy to the priest's ways of thinking in the first place. "Come in, sit down. Can I get you anything?" "No thanks, Father." Jeremy replied. He sat down on a wooden chair next to the fan. It was a hot enough afternoon that most people in the dome would have their fans on all day. "I have need of your advice." He said. The priest turned to Jeremy and looked earnestly into his eyes. He pulled a chair across from him and sat down, "What is it that troubles you, child?" "A dream, Father. A dream which has plagued me nearly every time I have closed my eyes for the last six weeks. I believe it to be a calling from God or the Angels." Geoffrey nodded gravely, "Tell me of your dream." I'm late this week! Sorry. It's been a busy busy week, but now that it's the weekend I have the chance to catch up. Delays like that should not happen again. Anyway, as they say, good things come to those who wait. 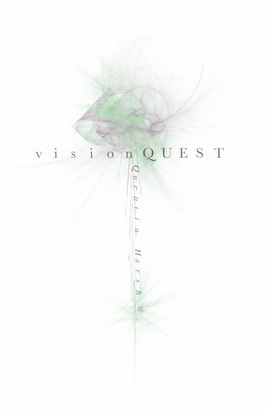 So here is this week's update at long last, part two of Quentin Harsh's Vision Quest! Though the council may be slow; it still might be a good idea to speak with Father Geoffrey about this. Dad wouldn't understand any better than anyone else; but Geoffrey has faith in our community, in our importance. He'll know what to do. Jeremy's thoughts were a tangle; but going to Geoffrey, the priest, seemed like the only course of action. Jeremy climed down from his bed and dressed himself. He headed out the door of the hut and washed his face in the stream before starting down the path to the rectory where Father Geoffrey lived. The path was surrounded by beautiful Kauri trees, thick shrubbery and vines. The New Zealand Dome had always been Jeremy's favorite; and he was glad to have his hut put here when he came of age. He had grown up with his parents in the Congo Dome, which had always struck him as too hot, most of the year. When he reached the Rectory, Jeremy was feeling nervous. What if Father Geoffrey didn't believe him? Of course he would. Geoffrey was very closely in touch with spritual forces. He had become, in only the eleven years he had lived in New Eden, the most influencial figure in the community. Most of the Old People didn't respect his wisdom; but his followers, particularly the Deacons, were deathly loyal to him. The door opened. Geoffrey was neither tall nor imposing. His eyes were as round and soft as his skin. He had a roundish build, but he was by no means fat. He was approximately thirty-five, Jeremy had never asked him his age. Geoffrey's black hair matched his robes, and only served to accent his bright blue eyes. His smile was warm and inviting. Glass stretches out as far as the eye can see. The sun is perpetually blocked by thick, grey, uniform clouds. Above the horizon, it is grey; and below the glass reflects colorlessly. The only thing which breaks the monotony is a glow which sits a little less than halfway from the horizon. It is not strong, but it is distinct. The Glow is entirely formless. It is the color of hope. A sound radiates from this hope-colored Glow; the sound is that of distress. It is not a human cry of distress, nor the call of any animal which has ever walked the earth. This is the sound of distress itself. From beyond the horizon came a swarm of black. The unknown darkness tore across the frozen sea and sent shards of glass in all directions. They closed in on the Glow. When it's light was snuffed out, so was the sun. The same dream. Always the same. Every time he slept, Jeremy was plagued with this nightmare. Every night for six weeks. Every nap. If he woke in the morning and went back to sleep, he'd have it again. Six weeks and it was all he could think of. And though most people would be confused by a dream of this kind, Jeremy knew what it meant. He understood the meaning. No one would believe him, of course. Alan didn't believe in such superstition; he was much like the Old People in that way. Emma would tell him that the journey was too long, she was ever the conservative. The rest of the village would want further proof. They would most likely cast lots or have the priest interrogate him. And even if the priest accepted his vision as having divine origin; there would be endless voting amongst the council as to what was the appropriate action. Nothing was ever done quickly in the village of New Eden. No, Jeremy knew that this was urgent; that he had to leave immediately. They knew nothing. At the shop where we hammer metal a man cut off his hand. The police, or what we call the police, came in and brought him outside. I heard the sharp, single pelt of gunfire and a harsh thump. I know that we might have made that metal. But it was like before only with nothing to distract our minds from the real truth. See more of Father Geoffrey and Jeremy in the upcoming weeks on canonFOUR! Parts 4 and 5 of the wonderful Toilet Paper Diaries. Next week we see the concluding entry and a little preview of the next story! Don't forget the canonFOUR button that you can place on your own website (great for myspaces!). If you can, please consider affiliating with us! The High Reign made a statement today on the intercom system in Circle Town. We all stood their in the circle center and looked up to the smocking stocks of hell reaching to heaven. She stated to the many listeners that the time had come for Circle Town to bring done the walls and widen the border. The Pilgrims will be visiting soon. Hopefully they will know some news from the other countries. I wonder if they might be able to tell me if my son or my sister or my mother may still be alive. America was the first to crash, then Great Britain, then China, then Japan, then Africa, then South America. The Meltdown. No communication, no way of knowing. I feel so cold today; when I walked home from the circle center I accidentally knocked a child down. I did not stop to help the young boy up I just turned away and walked on. Maybe this place is rubbing off on me. Maybe I have lost my humanity.